I have a confession to make: I don’t like Whoopie Pies. I know, I know – I live in New England and I don’t like the staple dessert that everyone seems to lose their marbles over. I’m sorry, but I just don’t get it. Why are they so great? It’s cake-like cookies with Marshmallow Fluff shoved in the middle (and Fluff is made in the boyfriend’s hometown, so I’m even more of a terrible person). So from time to time, I’ll pick one up that was locally made and bring it home for the boyfriend to enjoy – but I never bothered to make them myself, knowing I wouldn’t eat them. But it hit me the other day – why don’t I just make them in a way I would eat them? If I swap out the Fluff filling for more of a frosting, and make a slight change to the cookie-cake discs… I’d be much more apt to hide them in my nightstand for a midnight snack. The first batch came out more domed than I was looking for because silly me only added baking powder and forgot about the baking soda. So do as I say, not as I do. The light, minty, light green filling make these the perfect treat for a St. Patrick’s Day party. Or you know… midnight snack. 1) Preheat oven to 375º F.
2) In a large bowl, combine butter, sugar, brown sugar, baking soda, baking powder and salt and beat on medium speed until well combined and fluffy. 3) Add egg, vanilla and cocoa powder and beat until well combined. 4) Add milk and start with mixer on lowest speed to prevent the milk from splashing all over the place. Slowly increase the speed and beat until well combined. 5) Gradually add flour and again, on the lowest speed, mix until well combined. 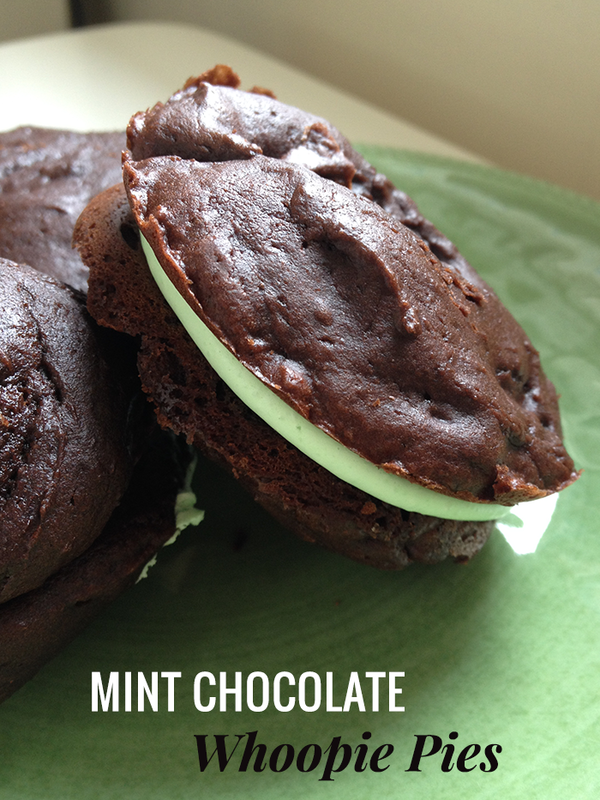 6) Scoop batter into whoopie pie pan and bake for 7-10 minutes. They’ll be done when they spring back to the touch. If you don’t have a whoopie pie pan, you can drop tablespoons of batter onto prepared baking sheets instead. 7) Remove from oven and let sit for a few minutes in the pan, then move to wire racks to cool completely. 8) While cookies are cooling, in a large bowl, beat butter at medium high speed until fluffy. 9) Add milk and peppermint extract, beat well. Gradually add powdered sugar and beat until well combined. If the consistency is too thin, add tablespoons of powdered sugar and beat after each addition until it has reached the desired consistency. 10) Now add drops of food coloring and beat after each addition until it has reached the desired color. 11) Using a pastry bag, pipe filling onto the flat side of one cookie, then top with another cookie (flat side down). Alternatively, you can just scoop the filling onto the cookie and spread it with a spatula. Get creative! Try rolling the sides lightly in some sprinkles, or add 1/2 cup of mini chocolate chips to the batter for extra chocolately bites. Enjoy!